It’s spring and you can go out RVing again! As you open the door to your RV, your life flashes before your eyes and your chest starts to tighten up. This must be what a heart attack feels like! Your interior is ruined! Leaves are strewn everywhere, bugs are crawling on every space, and even a skunk has built a nest in your custom leather seats with the gold lettering! A high-quality RV cover can save you thousands of dollars in damage, and is vital, even if your RV stays in a garage. A cover is used to keep the bugs and rodents out. UV degradation is the number one cause of loss of value. It destroys everything in its path, and we aren’t just talking about a faded paint job. The paint protects the metal and plastic underneath, so if the paint is compromised, the underlying surfaces most likely are, too. Fiberglass also oxidizes, due to UV exposure, as does rubber (making it look chalky and old). 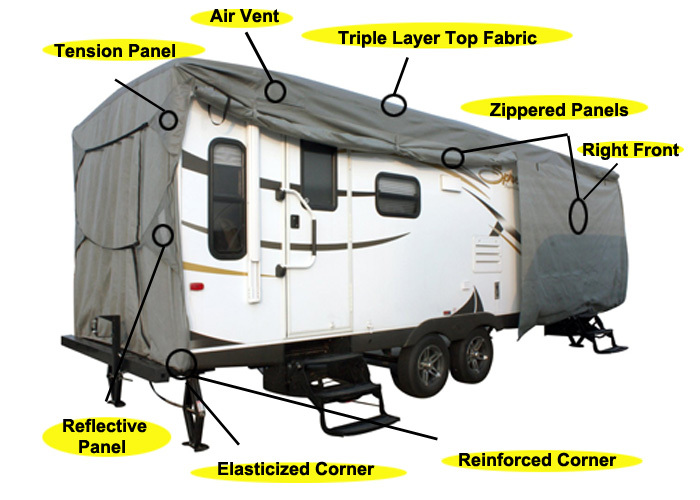 RV covers are generally made from polypropylene or polyester. Varying methods of tripling-of-the-layers are used over the roof, for extra protection. The fabrics are treated with water or UV repellant. They are also able to breathe, so that moisture can evaporate and doesn’t get caught under the cover, where it can trap mildew. 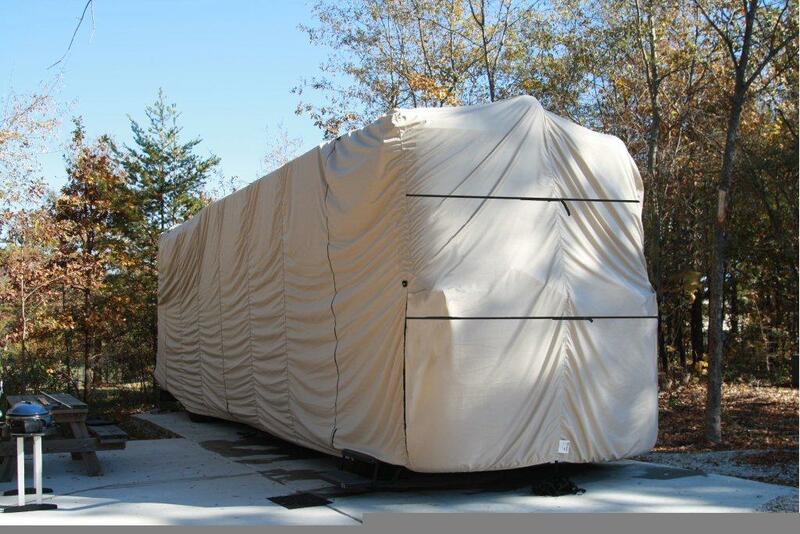 High-end custom RV covers have a tighter fit, and feature vents to prevent billowing. The cover is usually secured in place beneath the RV, with some covers having zips to allow access to the door. The better the quality, the lighter the cover will be, making it easier to handle. Custom covers are more expensive, but they provide better protection than universal fit covers. Look at covers for your type of RV. The cover for a camper is very different from that of a motorhome. 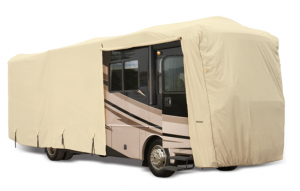 The correct size of cover will fit snugly over your RV. Measure your RV first, then go buy a corresponding cover. A larger cover than the size of your RV will be loose. The material you pick for your cover should depend on climate. Where will your RV be stored? Some covers are meant for dust, while others are meant for snow. 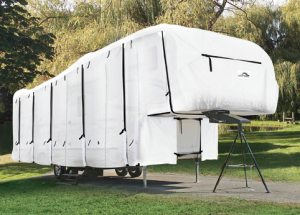 ADCO manufactures both universal and custom-fit covers for RVs. They use various fabrics that stand the rigors of the outdoors. SFS Aquashed is a cover made of a three-layer fabric and is intended for storage use in moderate climates. DuPont Tyvek RV fabrics are created to block up to 99.8% of the sun’s rays and 98% of dust particles that are more than 3 micrograms. It is also resistant to solvents, and acids found in bird droppings. Sunbrella fabric is a custom-only option that is made from a woven acrylic. It is resistant to cold cracking. UltraGuard from CAMCO is heavy duty and great for snowy climates. Its triple-layer top panel is created to repel water, while the vented design makes mold and mildew growth impossible. UltraShield is the opposite of Ultraguard. It is made of lightweight polyester and is great for sunny climates. It also has vent flaps that reduce billowing. 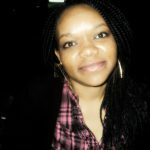 PermaPro is the most advanced cover in Classic Accessories product line, available from Amazon.com. It uses the same rip-stop technology that is utilized in parachutes. It comes with a four-year warranty. PolyPro 3 is made from polypropylene. It comes with a 3-year warranty and has three extra layers to provide protection from UV damage. PolyPro 1 is an entry-level cover that is made from a single layer of polypropylene. UltraTect covers are great for RVs that need protection from the sun. The fabric also has water shedding, and shape retention, capabilities. WeatherShield HD are covers that are dyed with a UV resistant dye. Sunbrella covers are made from the same fabric that is used in deck enclosures and sail covers. They have superior UV blockage protection. Eevelle offers three universal covers. Each cover features straps every 3-4 feet, and vents to allow moisture and wind to pass through. They also have a NO. 8 UV finish to help minimize sun damage. Their most popular selling brand, the Middle Line Expedition, is made from propylene and has a zippered side entry. They have a 3-year warranty. Wind ripping the cover to shreds. Sharp edges poking through the covers. Breaking components on the roof, that cost thousands to replace while installing the cover. Water damage can be devastating. As your RV sits there, neglected for months on end, while you wait for spring, water can wreak havoc. It is even worse if there is snow, because freezing makes water expand, and when spring comes and everything melts, it can create an even bigger mess. It provides protection from damaging UV rays. UV rays deteriorate plastic. Rubber, latex and calking will dry out and deteriorate. Fiberglass will oxidize and your exterior will fade, all because of UV damage. The sun, shining through a window and into the RV, will also cause your furniture to fade. Covers also protect from damage due to heat buildup, as they keep the RV cool. Covering your rig will keep it from getting dust, leaves, bird droppings, and other “dirty” stuff stuck to it. Save money on maintenance, and get yourself an RV cover. 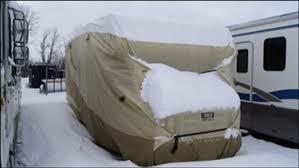 You will need to be very careful when installing a cover on your RV. It is also not very easy to remove, especially if it’s wet. Very strong winds can rip your cover off, if it’s not secured properly. Find someone to help you. If you’re on the roof, it helps to have someone on the ground. Take the cover out of its box, then spread it flat on the ground. Un-clip all hooks, open all zippers, and get a good look at it. Figure out what goes where and how. It can be dangerous to climb up on the roof, so be confident of your footing, and your RV’s ability to handle your weight. You could also use a ladder on the side of the RV, instead of climbing on the roof. Regardless of how you do it, be careful not to break antennas and gutter spouts. 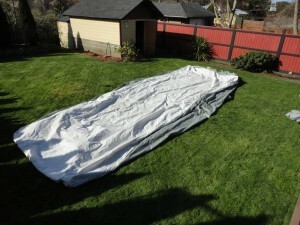 The cover must be secured tightly, or it can come loose due to strong winds. Mother Nature will always win when it comes down to a fight, but some fabrics will last longer than others. So, remember that quality is never cheap. Chose fabrics that are breathable, to keep mold and mildew from growing. Tires and wheels should be covered as well. Wash your RV before covering it, to prevent abrasion from dust and dirt particles.